I LOVE Secret Recipe Club reveal days – they definitely make Mondays way more fun than they usually are. I missed out on participating last month, so I’m extra excited to be back in it for the month of March. This month I was assigned Authentic Suburban Gourmet, which is quickly turning into one of my new favorite food blogs. It’s written by Lisa, who lives in the Bay Area with her husband and a few of the cutest dogs ever (seriously, they are so cute!). I was especially blown away by her appetizer recipes, and I’ve added her Gooey White Cheddar Bacon Crostini, Roasted Shallot Dip, and Cranberry Cocktail Meatballs to my list of things to make for football season this year (only 6 months to go!). Since we’re in our temporary apartment, without anything but the most basic cooking utensils, while our house is (still!) being put back together after the flood, I decided to make something extra easy from Lisa’s site. 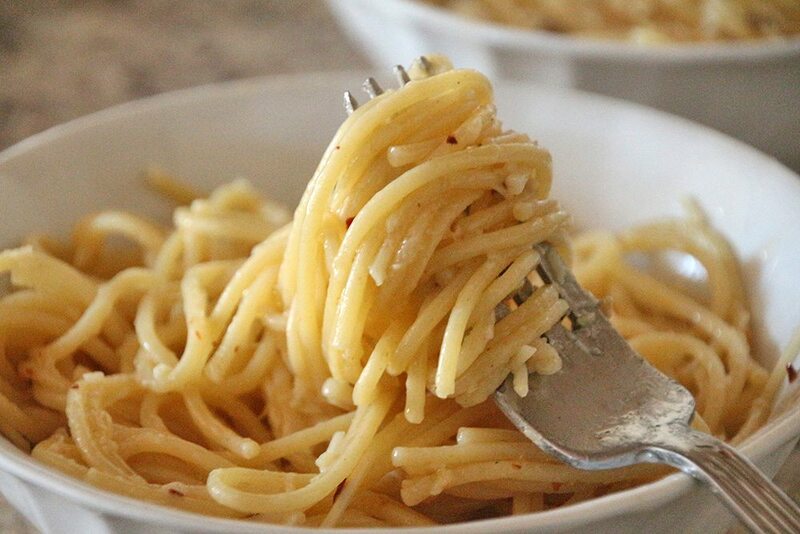 When I saw Spaghetti with Garlic, Olive Oil, and Red Chili Flakes, I knew it would be the perfect thing to make. This is an easy recipe (and you probably already have everything on hand to make it! ), but its flavor is anything but simple. I loved the strong hits of garlic and the spice from the red pepper flakes, and of course anything with Parmesan cheese is delicious. This is the ultimate weeknight meal: easy, quick to make, and full of flavor. Add it to your dinner meal rotation, and you won’t be sorry. 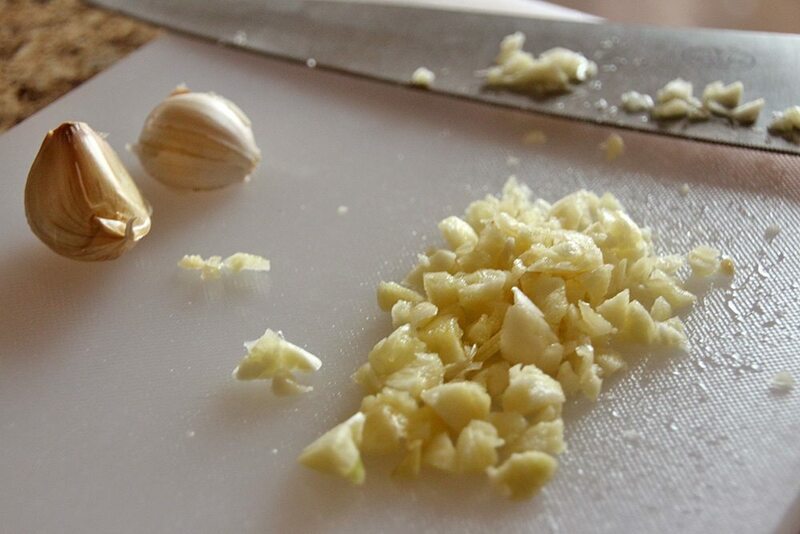 While the pasta is cooking, chop the garlic. 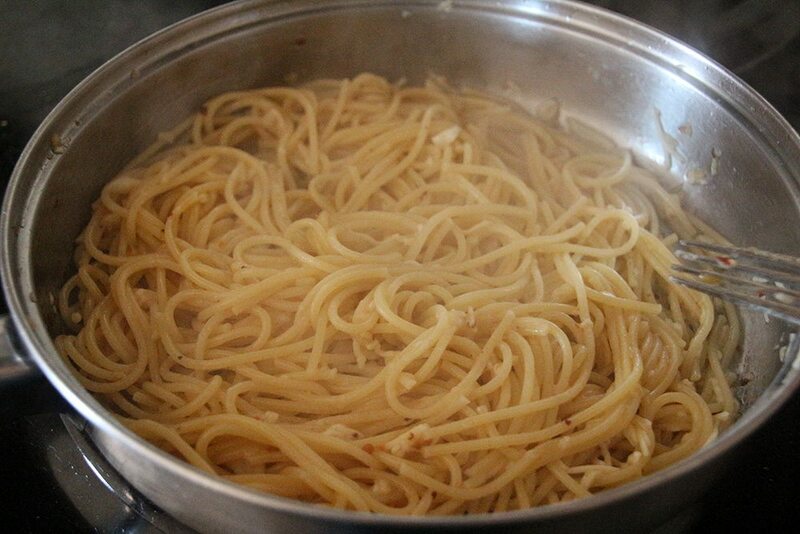 When the pasta is about halfway done, heat the olive oil over medium heat in a skillet. 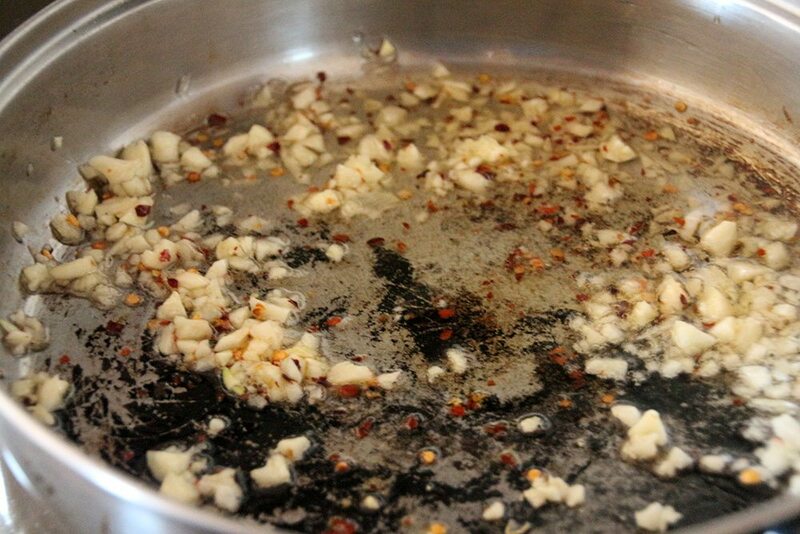 Add in the garlic and the crushed red pepper and cook until the garlic is fragrant and slightly brown, or 3-5 minutes. When the pasta is al dente, reserve 1/8 cup pasta water and drain. Add the pasta and water to the skillet, and stir in 1/4 cup Parmesan cheese. 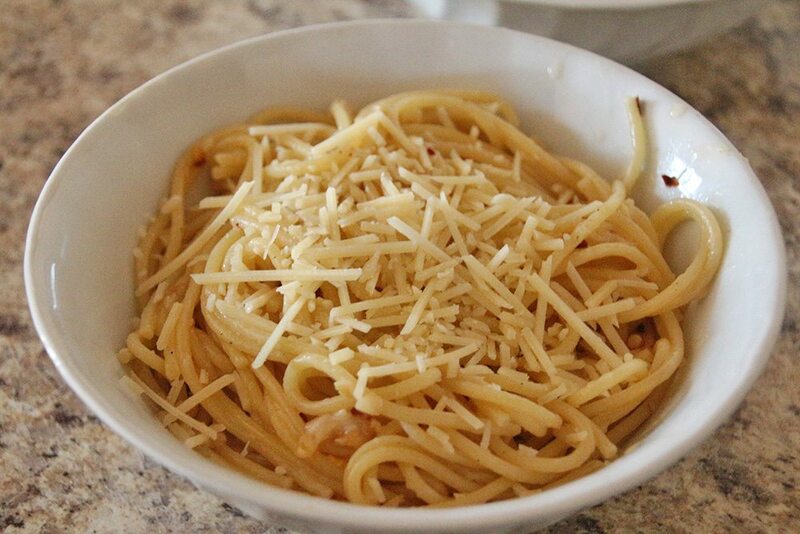 Divide the pasta between two bowls and top with the remaining cheese. Drizzle with additional olive oil, if desired. Yum!! If I wasn’t eating lower carb, I would be adding this to my meal plan for the next couple of weeks. Simple but oh so delicious! Sometimes I tend to forget that the nummiest things don’t have to have 10,000 ingredients. LOVE garlic and crushed red pepper! Perfect! 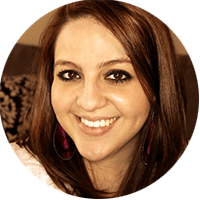 I had your blog this month for SRC, enjoyed reading all about you and discovering your recipes! Loved the Goat Cheese Mac N Cheese. So glad that you enjoyed my blog! I too love my little doggies – Marty and Stewart! 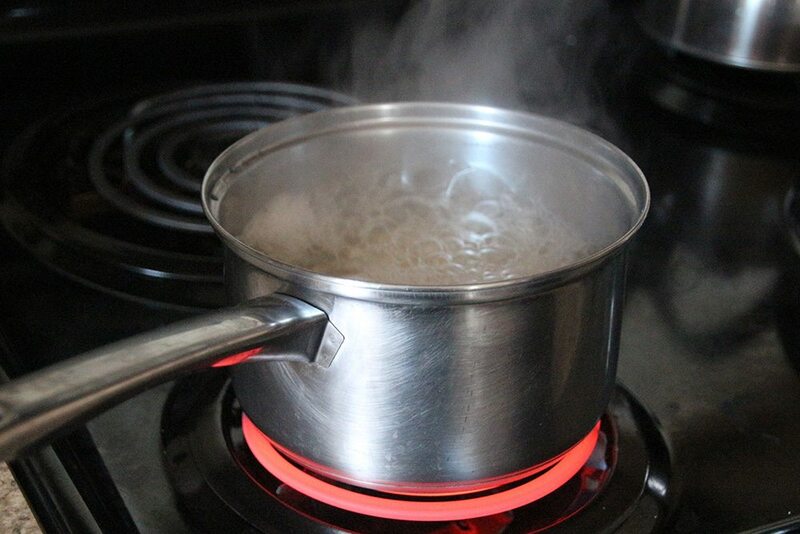 You picked a great yet simple recipe that is one of my favorites. You reminded me that I need to make this really soon. 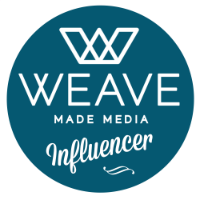 Look forward to checking out your blog soon! 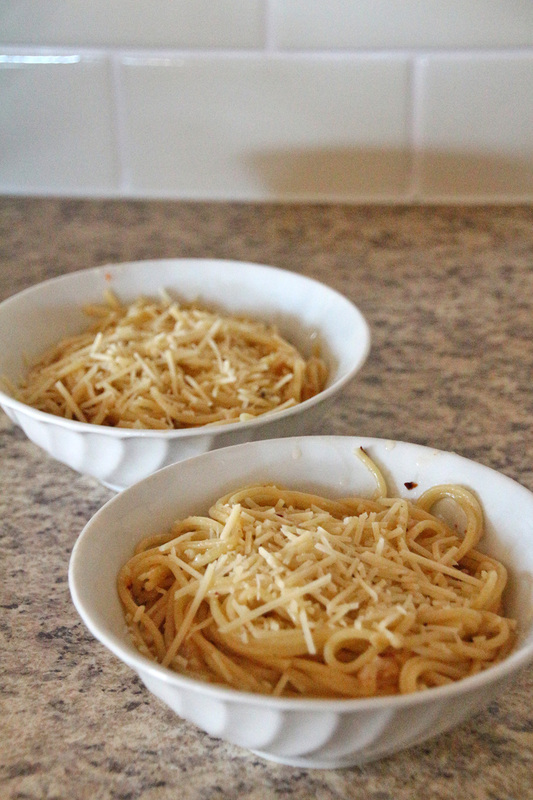 I’m Italian American so this is my kind of comfort food – simple pasta with fresh flavors! That just looks delicious!!! Sometimes you just need a good pasta dish, ya know?! Happy Monday! The simpler the pasta, the fewer the ingredients, the better it tastes. Love the looks of this one!! 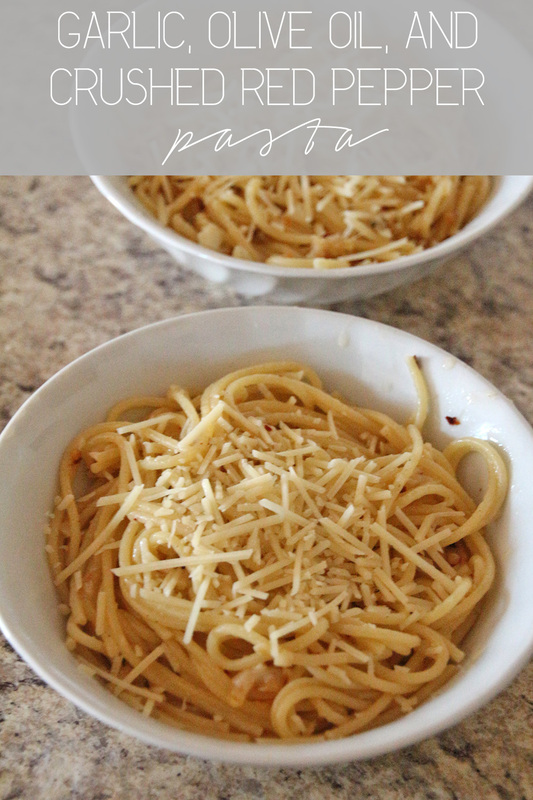 Love this oh-so-simple pasta recipe! I need to try it with gluten-free pasta soon!